The Consolidated CDA (C-CDA) is a US-realm specification. 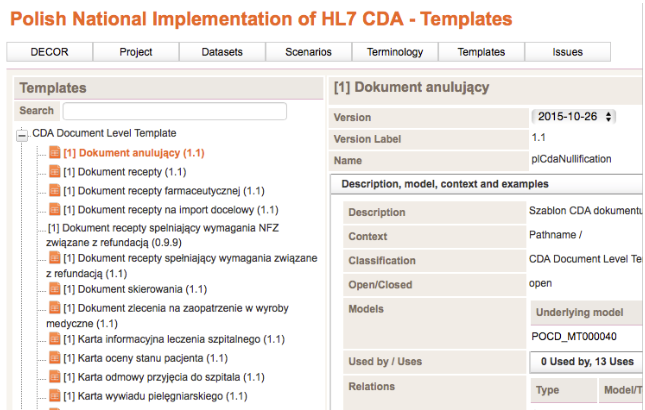 Meanwhile Release 2.1 has been published by HL7 International, with over 210 Templates and their associated value sets. Although it serves US centric requirements – with US specific code systems (like such as CPT-4 and RxNorm) and value sets, US specific identifiers, requires Race and Ethnicity that is inappropriate in many other countries etc. –, it has been, is and will be a source of inspiration for a lot of other projects, e.g. in Europe. While the original C-CDA specifications focus on Implementation Guides, the ART-DECOR Building Block Repository (BBR) features all 370 Templates and Template versions as a Template Library that can easily be used in any ART-DECOR project, whether as-is or as a basis for refinement or adaptation. For more information about ART-DECOR's Building Block Repository feature see here. In addition to the C-CDA Release 1.1, published through the ART-DECOR BBR mechanism many months ago, now also C-CDA Release 2.1 was made available through exactly the same type of repository. It must be noted that this setup is an amalgamation of C-CDA 1.1 and 2.1: Templates and Value Sets are labeled appropriately with "1.1" or "2.1" respectively but appear as versions of each other. The templates and value sets for 1.1 and 2.1 in this ART-DECOR project are transformations from the proprietary export format of the Lantana's Trifolia Workbench. They have been revised and corrected manually to fit the requirements of the Templates DSTU and to allow proper schematron generation. Please note that parts of the Trifolia Workbench maybe copyrighted by Lantana Consulting Group (see http://www.lantanagroup.com). A couple of years ago a project started to harmonize epSOS (the European Patient Summary document) and CCD (as in C-CDA). A new project called "Interpas" (International Patient Summary) is seen as an attempt to create a document definition to exchange patient information for persons traveling between Europe and the US. The specification is planned to be jointly balloted with ISO. 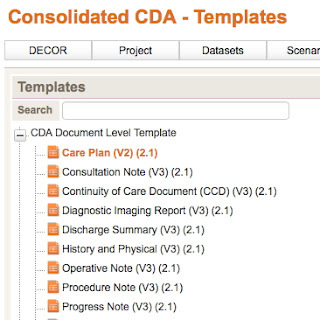 Originally included in C-CDA, for Diagnostic Imaging Reports there is now the DICOM PS3.20 "Imaging Reports using HL7 Clinical Document Architecture". It features - as of now - two document level templates: Imaging Report (1.2.840.10008.9.1) and Imaging Addendum Report (1.2.840.10008.9.24). On the main servers hosted by the ART-DECOR Expert Group (ADEG), C-CDA 2.1 is available automatically. It is published under http://art-decor.org/art-decor/decor-project--ccda-. In order to update the BBR cache on servers or installations that are not hosted by ADEG and that do not have automatic refreshing, please refer to the instruction manual section Refresh External Repository Cache to update/refresh the BBRs. In regular ART-DECOR projects it is easy to either link C-CDA Templates from the repository as-is by linking them into your project or to refine them by specialization or adaptation.